"So much fun it should be illegal"
Love Theatre? Click above for a backstage tour or class and learn more about our production of Legally Blonde The Musical! Anthony Avino* (Nikos, Ensemble) is ecstatic to be back at Riverside! Regional credits include: Beauty and the Beast (Drury Lane), Joseph...Dreamcoat (Drury Lane), West Side Story (Drury Lane), Singin’ In The Rain (Palace Theatre), Saturday Night Fever (WBT and Riverside/Walnut Street), Mamma Mia (Riverside/Walnut Street). Other Credits: Lysistrata Jones (Uardo’), Rent (Angel), The Rocky Horror Show (Dr. Frank’N’Furter). BFA Roosevelt University CCPA. Lots of love to my Family, Friends, Bae, Don, Gia, Mom and my new godson Massimo! Follow on Instagram @Anthony1331. Proud Member of AEA! Sara Brophy* (Brooke Wyndham) was last seen at Riverside Theatre as a nun in Sister Act! Born and bred in NY state, Brophy’s very grateful to soak up some sunshine! You may have seen her on Broadway in Amazing Grace, off-Broadway in Iron Curtain, or on TV in “Law & Order: SVU.” She's traveled nationally and internationally working as an actor, dancer, and singer in theatre, film, television, commercial, and voiceover. Some favorites include: Anna in Syncopation, Senga in Dancing Lessons, and Kathy in Singin’ in the Rain. For more, follow on Instagram @SaraBeesKnees or sarabrophy.com. Thanks and love to Richard, TPS, and JFB! Kathryn Brunner (Elle Woods) snaps for making her Riverside debut! Recent credits include: Sophie in Mamma Mia (Pioneer Theatre Company), Laurey in Oklahoma! and Ariel in Footloose (Arrow Rock Lyceum Theatre), and Mary Phagan in Parade (Arden Theatre Company). Kathryn also spent a year as a lead vocalist for Norwegian Cruise Lines. When she's not performing, Kat is a fitness trainer at Body By Simone NYC. Mama- thank you for teaching me the power of being a strong, blonde woman. Shoutouts to The Price Group and her family and friends for their endless support and love. Temple Made '16. As always, for Dad. Caroline Chisholm (Serena, Ensemble) is thrilled to be joining the Riverside family! Caroline, originally from NC, holds a degree in Musical Theatre from Wright State University. Currently living in NYC, she has most recently performed at Westchester Broadway Theatre in Anything Goes and The Little Theatre on the Square in numerous productions. Favorite credits include: Velma (Chicago), Mary Robert (Sister Act), Dorothy (The Wizard of Oz), Janet (Rocky Horror), Janet (The Drowsy Chaperone), and Fiona (Shrek). She would like to thank her Mom, Dad, Bryan and Jeannetta for their continuous support, and Richard for this wonderful opportunity. Bend and Snap, y'all! Scott Langdon* (Dad, Winthrop, Ensemble) is grateful to return to the Riverside Theatre, having last appeared here as Gatch in H2$ in 2014. Most recently, Scott was seen in the Eagle Theatre’s breathtaking production of Ragtime (Grandfather/Willie Conklin). Some favorites include: Spamalot (Arthur), Mame (Mr. Upson), Oliver! (Fagin), The Music Man (Charlie Cowell), Love Story (Dr. Ackerman), 1776 (John Adams), Julius Caesar (Cassius), The Crucible (John Proctor), The Who’s Tommy (Uncle Ernie), Grand Hotel (Otto Kringelein). As an author, Scott has three titles available on Amazon. Find them at scottlangdonwrites.com Love to his children, Mikaela and Connor, and his wife, Sarah. Kristyn Pope* (Ensemble, Dance Captain) is grateful to Richard and the Riverside/ Walnut families for this opportunity, with special thanks to Paige at Resolute Artists Agency for her guidance and support. “You have to take risks…We will only understand the miracle of life fully when we allow the unexpected to happen.” ~Paulo Coelho. In loving memory of her incredible mom. Agape…Ps100. Paul Schoeffler* (Professor Callahan) Broadway: Rock of Ages (Hertz), Sweet Charity (Vidal, opp. Christina Applegate), Peter Pan (Hook, filmed), Sunset Boulevard (DeMille w. Glenn Close), Beauty and the Beast (Lumiere), Cyrano (LeBret), Nine, Victor/Victoria, and Sunday in the Park with George. Numerous Off Broadway including: Wintertime at Second Stage, world premieres of No Way to Treat a Lady, Martin Luther on Trial. National tours: Javert in Les Misérables, Sheldrake in Promises/Promises. Paul has performed many lead roles regionally including world premiers of: Phantom (the Count) by Yeston/Kopit and The Glorious Ones (Flaminio) by Ahrens/Flaherty. Regionally he has received two Barrymore, Broadway World and LA Ovation nominations for various roles including Henry Higgins, Don Quixote and Emil De Becque. Extensive voice-over work for NBC, CBS, CNN, ESPN, National Geographic, The Cartoon Network and many commercials. TV: guest starring roles on “The Blacklist,” “Person of Interest,” “Law and Order” among others. Best job: dad to Aidan and Ana, husband to Aixa. Frankie (Bruiser) was rescued by his guardian/trainer William Berloni in 2008 from the Meriden Humane Society in Meriden, CT for the National touring company of Legally Blonde. 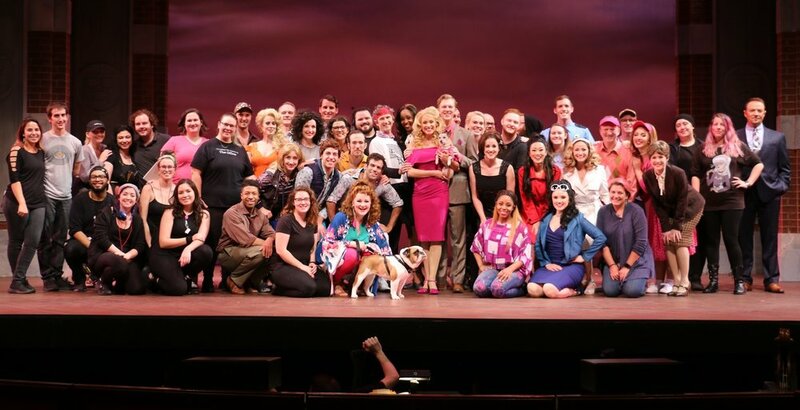 Frankie holds the record for doing more performances of Legally Blonde than any human or canine actor. He is an example of how rescue dogs can be stars. Myrtle (Bulldog) joined Theatrical Animals when William Berloni rescued her in the Fall of 2018 from the Humane Society of New York. She made her acting debut in February 2019, with actors and audiences falling in love with her. She looks forward to carrying the banner of what a rescue dog can do.